Resource center How Is a Proper Drug Intervention Carried Out? 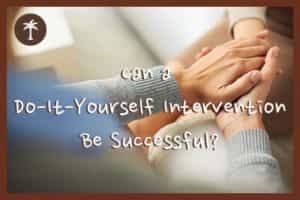 Can a Do-It-Yourself Intervention Be Successful? Sometimes, people seek help when they realize that they are struggling with drugs or alcohol. However, too many times, a person struggling with addiction or substance abuse is unable to see the harm caused by the condition. They may be unable to admit they have a problem or feel unable to stop consuming drugs or alcohol. It is important for this person to know that they do have support to get help and overcome their addiction – support from the community, from friends and family, and from professionals who have experience helping people just like them. With reality television shows and documentaries delving into the world of substance abuse, and the increased use of interventions to help people struggling with these conditions, more people who know someone suffering from addiction understand that it is within their power to help their loved one. However, few understand exactly what an intervention is or how to plan one. There are many professionals who have training in intervention planning and procedure, and hiring a professional interventionist often makes for a more successful intervention. In other instances, a professional interventionist may not be an option, due to finances or other restraints. In these cases, family and friends may attempt to plan and conduct the entire event on their own in a type of do-it-yourself intervention. Whether the intervention is planned solely by friends and family or moderated by a professional interventionist, the intervention should accomplish a few priorities. Find specific examples of the impact of the loved one’s substance abuse, including destructive choices. Describe how those destructive behaviors hurt the friend or family member. Offer a well-researched detox and rehabilitation program. Describe how each friend and family member will support the person during treatment. Tell the person what everyone will do if the person does not pursue treatment. Understand the process. In many cases, one or two people will find that they want to help a loved one end an addiction and become a healthier person. They may mention this to other friends or family members, who may agree that it is time to get help for their loved one. Even if a professional trained in intervention techniques does not plan or host the intervention, it is important for this group to talk to a substance abuse counselor, physician, social worker, or other medical professional who works in the substance abuse field. Talking with someone who understands addiction treatment in depth can help the group gain perspective on the best approaches to help their loved one. Get information on treatment. It is important to know which treatment options will be a good fit for the person struggling with addiction. Both inpatient and outpatient rehabilitation programs have a variety of individualized options to work with different personal philosophies. Research these options by reading online reviews, recommendations from treatment professionals, and the program materials. Narrow down the choice to one or two rehabilitation programs, so this information can be presented to the loved one. This shows that the group cares deeply about this person and will support their efforts to get better. Pick the “core team.” These are the people who will host the gathering, invite the loved one, and lead the discussion. If the intervention is DIY, without much professional assistance, then the core team will also plan additional steps and take responsibility for action items that need to be completed. Decide what to talk about. It is important to stay on topic during the intervention, so the group, potentially including the professional interventionist, should gather two or more times to finalize who will speak about which topics and in what order. This keeps the intervention from becoming too negative or unsupportive. It also shows the loved one that the people who care about them have been worried for a long time and that they have thought the problem through. Decide on consequences. If the loved one does not accept treatment, refuses to acknowledge the problem, or otherwise refuses help, there need to be consequences. For example, a spouse who feels unsafe may leave for self-protection; if there are children involved, custody could be challenged in court. Set the date. Make sure there is a specific date and time that works for everyone, and that gives everyone some time afterward to emotionally recover. Make sure the intervention will be held in a safe space. Make sure the loved one struggling with addiction is available on that day. Hold everyone accountable for showing up. Hold the intervention. 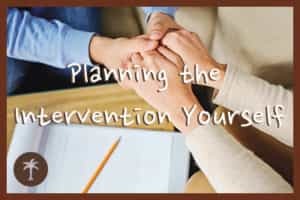 Stick to the plan for the intervention; at least one person, whether a professional interventionist or a loved one, should moderate the process and make sure the outline for the intervention is upheld. This person will keep the conversation on topic, and ensure that treatment options are discussed and understood. Stick to the consequences. After the intervention, it could be tempting for friends and family to fall back into old habits. If the loved one does not accept treatment, it is important for everyone to follow through on the consequences they described; if the person does accept treatment, it is important for everyone to prove that they support this individual’s recovery by being there for the person when needed. A major benefit of do-it-yourself interventions is community support. Friends and family of the person struggling with addiction can band together and support each other, as well as their loved one. New emotional connections could be formed, and old relationships can be mended, to help a person who everyone mutually cares about. This also shows the person who is struggling with addiction that they are not alone, and they do not deserve to continue to suffer. Instead, they have many people who love them and want them to get better. The person will have ongoing support, not just during treatment, but for the rest of their life after treatment. Many people who are confronted with an intervention will accept that they need treatment. Too often, people who struggle with addiction or substance abuse develop low self-esteem and feel like they are beyond help. They may feel like they deserve the detrimental consequences of their actions. This is simply not true, and having a private, intimate intervention, created for the person by people who love them, is a way to show that the person does not deserve to suffer and instead deserves to have a long, healthy life. Additionally, do-it-yourself interventions are free or inexpensive. Even when getting guidance from treatment professionals on some general approaches, the people who are part of the core intervention team know their loved one very well, and they can create a meaningful, positive emotional experience without spending money on a location to host the event. However, relationships with friends, spouses, and family can be difficult to change. People who have developed specific patterns of behavior around the individual struggling with substance abuse may have trouble speaking up during the intervention. They could have difficulty enforcing the consequences they propose. The whole family may not recognize that they need to participate in the rehabilitation program together, often through family therapy, to overcome systemic problems that may contribute to their loved one’s substance abuse. This is where a professional interventionist can be very useful. Intervention professionals cost money, but their help could be extremely beneficial. These individuals are trained in specific approaches to planning and discussing drug addiction and related treatments. Since they are not emotionally involved with the person who is struggling with addiction, they are more able to calmly approach the issue, moderate the intervention if there are other friends and family present, and discuss details about help provided by rehabilitation programs. They are may be able to host the intervention in an office or clinic, which is often a neutral location for everyone involved in the experience. An interventional specialist can also be a link to helping the loved one enter a rehabilitation program immediately after the intervention. Working with a professional to plan and host an intervention can be incredibly successful. About 90 percent of people who speak with an intervention specialist accept that the need help and will enter a rehabilitation program. Stay focused. Many friends and family members have been emotionally, or even physically, hurt by the person struggling with addiction. It is important that the content of the intervention address these concerns but maintains the primary focus on the person’s need to get help through a rehabilitation program. Do as much research as possible. There is only one decision that the loved one should ultimately make, and that is whether or not to seek help via a rehabilitation program. Finding a respected treatment program, professional support for other loved ones, and answers to potential questions as they come up is the responsibility of the core team. Stick to the long-term plan. This includes supporting the person while they are in the rehabilitation program or acting on the stated consequences, including legal action, if the person refuses to accept help. Be prepared for the person not to accept help. Sometimes, it can take some time before the person is willing to admit they have a problem with drugs or alcohol. The intervention may be the first clear indication they have had that their problem is serious. They may not believe they have a problem at the time, or they may not believe they can be helped. If they say “no” to help that is offered during the intervention, the information presented may sink in over time. They may find help later, in part because their loved ones carried out the intervention.